Sandra grew up in Sydney, Australia as a black-haired girl with two blonde sisters. She was not adopted, despite what they told her. Sandra first discovered her passion for writing in primary school when she was forced to write a short story for a school assignment. She was surprised to discover she really enjoyed it and began to read and write avidly. After graduating from university in Sydney, Sandra began working as a full-time statistician. 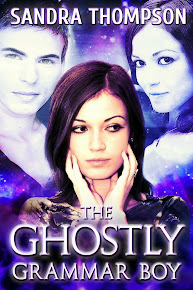 Her days were filled with number crunching, while her evenings were filled with Fiona’s exciting supernatural adventures as she wrote the first book of the Dusk Duo series, The Ghostly Grammar Boy. The book is now available for free on iBooks, Smashwords, Barnes and Noble, and Kobo. In 2011, Sandra moved to Tokyo, Japan, where she lived for three years and learned a lot about Japanese culture by making many mistakes. She wrote about her adventures in Japan on this blog. Sandra now lives in Sydney, Australia where she continues to work as a daytime statistician and a nighttime author. She is currently working on book two of the Dusk Duo series, The Deadly School Camp. Have a sneak peak at Fiona’s next caper at the The Deadly School Camp page. She is also writing a romantic suspense novel set in Tokyo called The Sakura Vacancy. Sandra loves to hear feedback from her readers and really appreciates the support of her blog followers.